Pare the pumpkin and cut it in half. Remove pulp and seeds. Cut into 2-3 cm / 1 inch chunks. Peel potatoes and parsnips and cut into similar-sized pieces. Wash brussel sprouts and cut in half. Remove skin from chorizo and cut into thick slices. Peel onion, ginger and garlic and chop finely. Cut chili peppers into thin rings. Heat clarified butter in pumpkin cocotte. Fry onion, ginger, garlic and chili peppers on medium heat for around 3 minutes, stirring constantly. Then add potatoes and parsnips and fry for another 3 minutes. Stir in turmeric and garam masala. Season with salt and pepper. Add broth and coconut milk; cover and bring to a boil, then simmer gently on low heat for around 20 minutes, until the potatoes are almost tender. 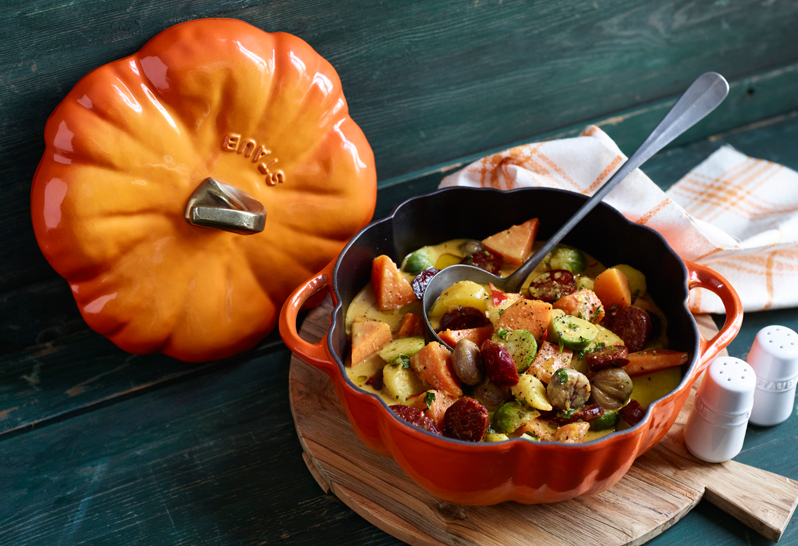 Mix in pumpkin, brussel sprouts, chestnuts and chorizo and cook for another 10 minutes. Season the curry with salt, pepper and 1-2 tbsp. lime juice. Pick the cilantro leaves from the stems; chop finely and stir in. Serve the curry in bowls or soup plates, garnished with lime wedges if desired. Tastes best with basmati rice. This looks really good! But I was wondering if the chorizo is the fresh (uncooked) variety or the cured/smoked variety? Thanks! Hi Danielle, this recipe calls for the cured/smoked variety of chorizo (sorry we didn’t specify, oops!). However, both fresh (uncooked) and cured/smoked chorizo can be used in the recipe – you would just have to cook the fresh chorizo in a cocotte/dutch oven prior to adding to this recipe. You’re welcome! Enjoy the yummy dish! Hi Jean, Great question! The best recommendation is to cook this dish and serve right away because some of the items (specifically the pumpkin and potatoes) may not have the same texture once reheated. However, if that is not a concern it can definitely be frozen and reheated at a later date. I would recommend thawing in the refrigerator the night before and not to season the curry with salt, pepper, lime juice and cilantro until you are reheating the dish. Thanks. Having trouble finding the type of pumpkin so may use squash instead. Will let you know how it turns out, and will follow your advice.